There is a king master suite on the main floor with jetted tub, walk in shower, toilet and 2 vanities. Two queen bedrooms with a Jack n Jill bathroom are upstairs. On the Terrace level there is (2)-twin bedroom with a shared bath and a (2) bunk bed plus queen bedroom. Additional Kids play area on terrace with work/play table, and low train table + Netflix. Parking is available for up to three vehicles. 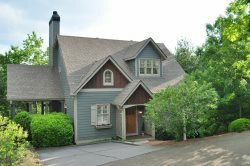 Ford Cottage is located near Big Canoe Village and Chimney’s Conference Center within walking distance to the Swimming Pool/lake/beach recreation area. What a beautiful place Georgia is! This was a perfect venue for our family wedding. What a wonderful scenery; our first time to say in these mountains. A super home away from home! A special time for our family, celebrating our nieces wedding. We loved staying at your home and today. It was beautiful. Saw deers, turkeys, but missed the bears. Thank you; we loved it. Our family thanks you from the bottom of our hearts for your hospitality and sharing your beautiful home with us. We had a wonderful time at Big Canoe. Thank you so much for our stay! It was the perfect getaway for us to celebrate Robbies birthday. Your home is beautiful and we look forward to coming back again soon!